Dorsey Alston associates gathered early Saturday morning to put finishing touches on a home built by Habitat for Humanity for Santeria Reedy and her son, Antonio Willis Jr. The home, located in East Atlanta and sponsored by the Atlanta Board of Realtors® and Wells Fargo was built over a period of eight weeks. Dorsey Alston assisted in landscaping and cleaning before watching the dedication ceremony. 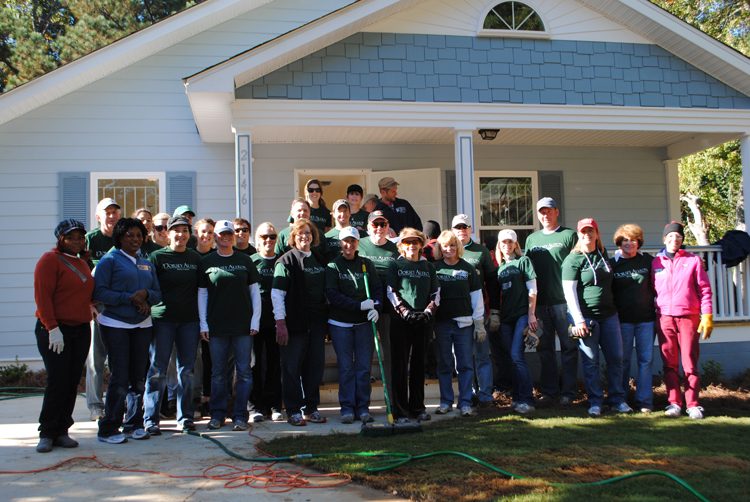 Dorsey Alston associate Morgan Rogers served as an Atlanta Board of Realtors® Habitat Weekend Coordinator. Completion of this home marks the Atlanta Board of Realtors® 10th annual Habitat for Humanity home build project which reinforces the Board’s focus of promoting homeownership.